The flagship of Chaparral’s H2O line has something never seen before: outboard power. Since 1965, Chaparral has built its reputation on its premium line of sterndrive-powered boats, not introducing an outboard model until the 2015 model year. But the 21 H2O OB Fish & Ski proves the builder from Nashville, Ga., can pivot with the best. The H2O series is its entry-level portal, meant to bring boaters into the Chaparral family at a lower price, but the builder manages to deliver a fully loaded boat with many of the high-end touches from its other boats, such as stylish looks. The H2O line is Chaparral’s first foray into the fishing-ready, multipurpose market and brings with it the builder’s unique sense of style. The H2O lineup is fairly compressed in size, featuring an 18 and a 19 in addition to the 21-foot, 6-inch model we tested. While the 21 is roughly two and three feet longer than its junior members, it’s a full 10 inches wider at 8 feet, 4 inches, which has a huge impact on interior space and overall stability. The sterndrive counterparts in the H2O line came out in 2015, and it’s clear the designers didn’t reinvent the wheel for the outboard versions — didn’t need to. The giveaway is the giant stern storage compartment that’s, coincidentally, cavernous enough to house a V-6 engine. The space will thrill anglers who carry lots of lures and is also a place to store the cushions. Chaparral did a great job of integrating its fishing features in this model. Instead of a regular stern bench similar to the one on the 21 H2O Sport (pictured on the cover), a pair of fishing seats next to each gunwale can be removed and mounted on pedestals, fore and aft, which solves the problem of finding storage space for the fishing seats. Flipping the hatch on the center section of the stern bench reveals a 70-quart livewell. While Chaparral probably decided to go with a diamond nonskid deck to keep costs down, it’s a good call for a boat that will see lots of fishing and skiing action. Fiberglass is easier to clean than carpeting and doesn’t get sodden when swimmers and skiers move in and out of the boat. Buyers can add snap-in carpeting for $335. Anglers overwhelmingly prefer outboard power, and this version of the 21 H2O Ski & Fish will likely outsell the I/O version by a handy margin. In almost every case, the outboard will outperform the sterndrive-powered boat even if it has less horsepower, and that’s certainly the case here. Our test boat was powered by the Yamaha F150, which was a good match even though the boat is rated for up to 200 hp. Its time to plane was 3.3 seconds with very little bowrise, and it reached 30 mph in 6.5 seconds. Top speed was 48.2 mph. A performance test by another independent online entity of a 21 H2O Sport with a 260 hp MerCruiser 5.0L V-8 engine timed it to plane in 3.2 seconds and to 30 mph in 8.9 seconds, and recorded a top speed of 50.2 mph. Since our testing protocol might be different than its, I compared those numbers with its test of the same boat with a Yamaha F150. On that test, time to plane was 3.0 seconds and time to 30 mph was 7.7 seconds, and top speed was 48.4 mph. To be fair, the temperature was 18 degrees hotter for the sterndrive test, but with 110 less horsepower, it was faster to plane and to 30 mph, and only 1.8 mph slower at the top. The boat can be outfitted with Mercury power. It’s surprising how much time we spend idling around, but not much is ever printed about how a boat handles at slow speed. And to me, one of the big advantages of outboard-powered models is how much easier they are to keep in a straight line at idle. But at speed, this hull handles really well no matter the power choice. Its Extended V-Plane hull features 20 degrees of deadrise at the stern, which gives it good slicing action in the chop, like we had on test day on Lake Lanier, north of Atlanta. It stayed on plane at 17.2 mph at 3000 rpm, which allows the driver to go slow but remain in control should larger waves suddenly pop up. It was a bit cool, so the full walkthrough dam ($168) and the sportily raked, tall, curved glass windshield were greatly appreciated. The 21 H2O OB is easy to turn thanks to standard SeaStar hydraulic steering on every boat with 150 hp or more. The F115 gets BayStar hydraulic steering. The Ski & Fish portion of the boat’s name reveals its two main missions. 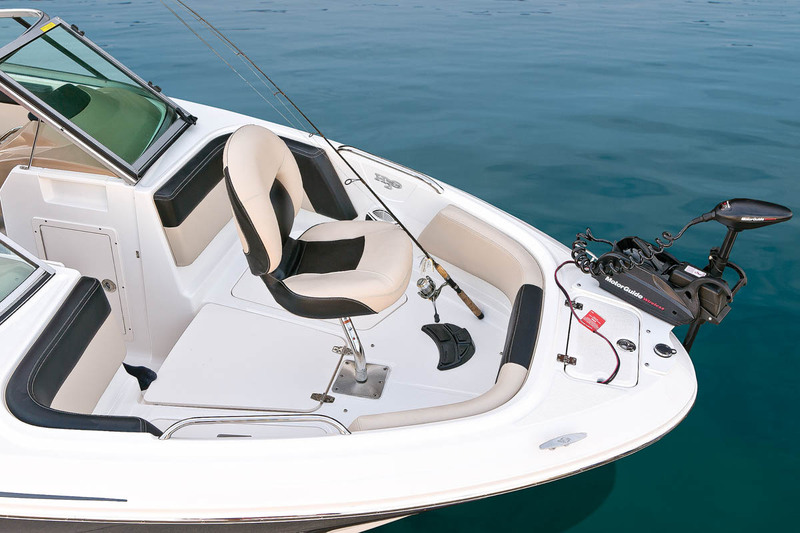 Usually, when the word ski comes first, it’s because the fishing features are weak, but Chaparral created a competent boat for anglers without the need to add optional features. 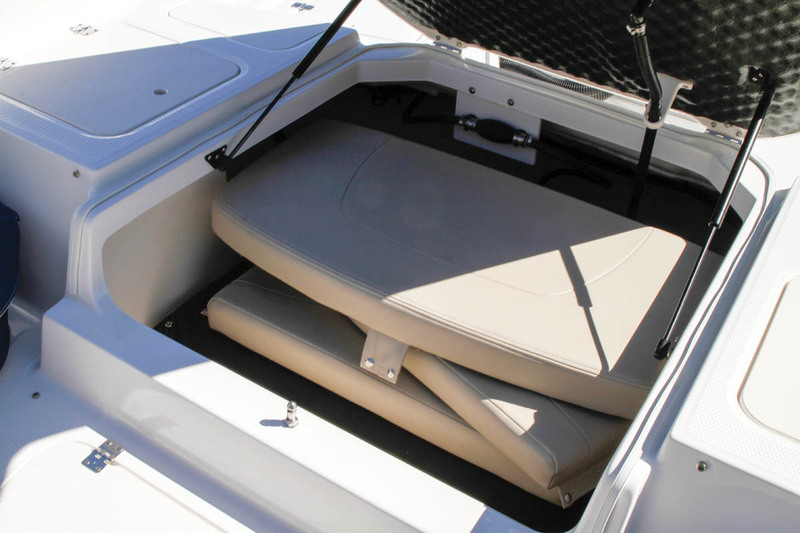 In addition to a rear casting deck, the boat has one up front once the cushions are removed and a filler section is added to the gap between the bowrider seats. It comes ready to fish with a standard 75-pound thrust, 24v wireless MotorGuide trolling motor that does away with the need for a space-consuming foot control. It also has a clever feature I’ve never seen before on any fishing boat: a sole-mounted rod holder, which will be handy for changing lures or waiting for a strike when using live bait. Its skiing chops are good too, with features such as a centerline ski (or fishing rod) locker that includes a hole in its lid for curling an index finger through to open it, but it does allow rain to enter. It really needs the standard latch here, preferably a lockable one. The bow storage compartments are another clue this is a “price boat.” They require users to lift the entire seat bottom off instead of using hinges. There’s a transom ski tow eye, but a brushed anodized aluminum ski-tow frame ($486) or a folding Velocity watersports tower in white or black ($2,300) is a better option. 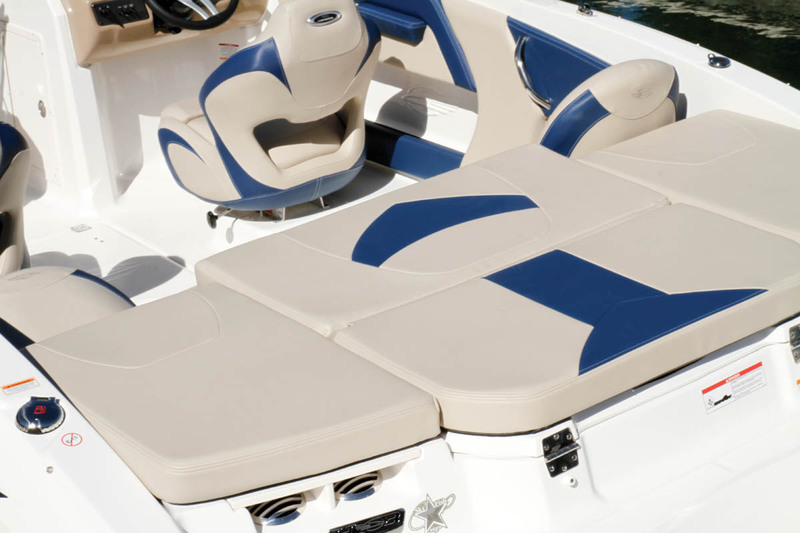 The 21 H2O is a comfortable cruiser thanks to twin captain’s chairs and really comfortable bowrider seats. Coaming pads circle the entire boat, which makes it more toddler friendly. For extended cruises, the boat has a generous 40-gallon fuel tank. At rest, the stern sunpad’s ends can tilt up for more comfortable lounging. Chaparral gives owners a well-equipped boat, complete with a tandem-axle trailer, starting at a nationally advertised price of $34,450 that includes a choice of 12 styling schemes with color-coordinated UV-resistant upholstery. 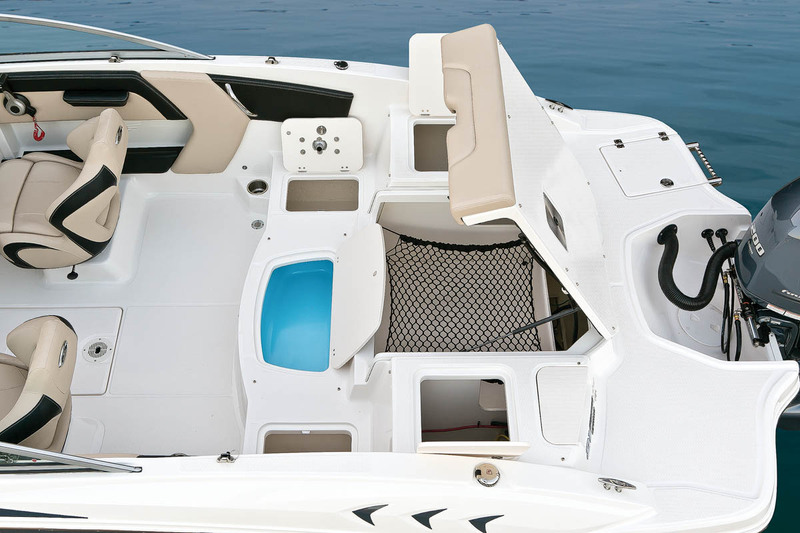 The addition of the Deluxe Package ($820) checks a number of must-have options, including a Bimini top, upgraded port and starboard captain’s chairs with flip-up bolsters, a digital depthfinder, a port console storage door and special badging. 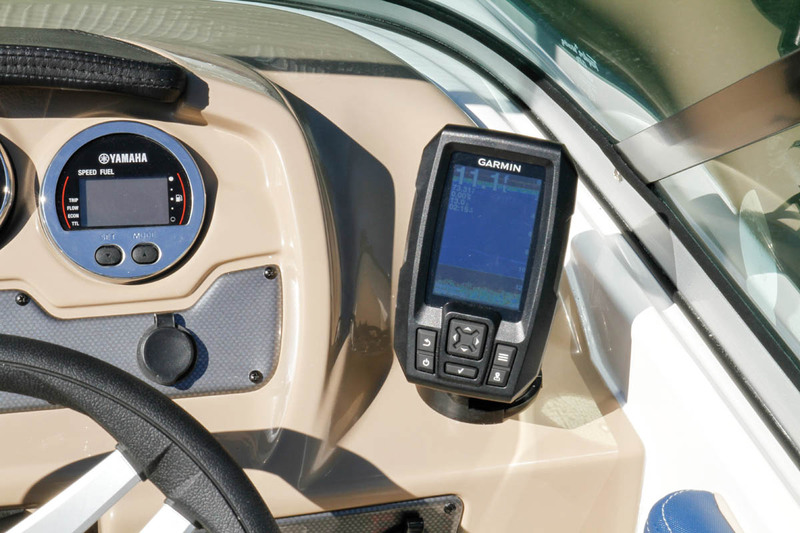 At the helm, buyers can add a ram-mounted Garmin Striker 4-inch color fishfinder/GPS for only $200. 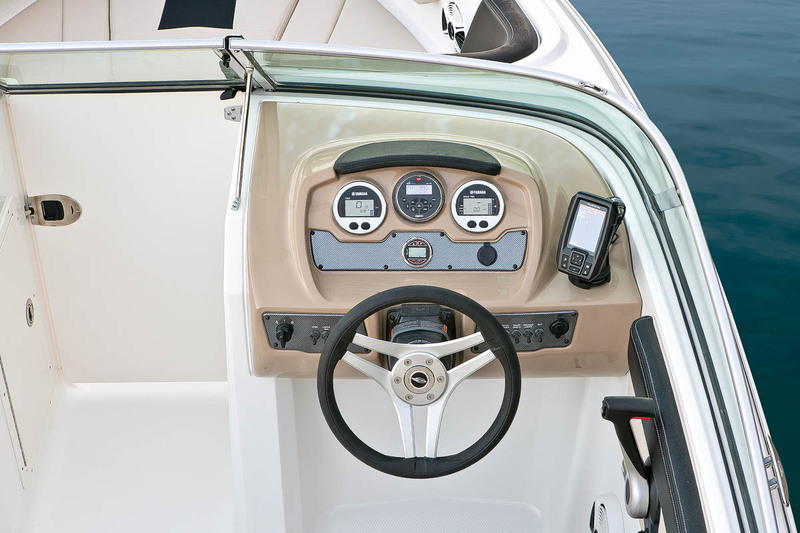 The stereo upgrade to a Clarion Bluetooth model with a transom remote is well worth $395. For power, stay away from the F115 that’s part of the nationally advertised package, especially for skiing or fishing on larger bodies of water. 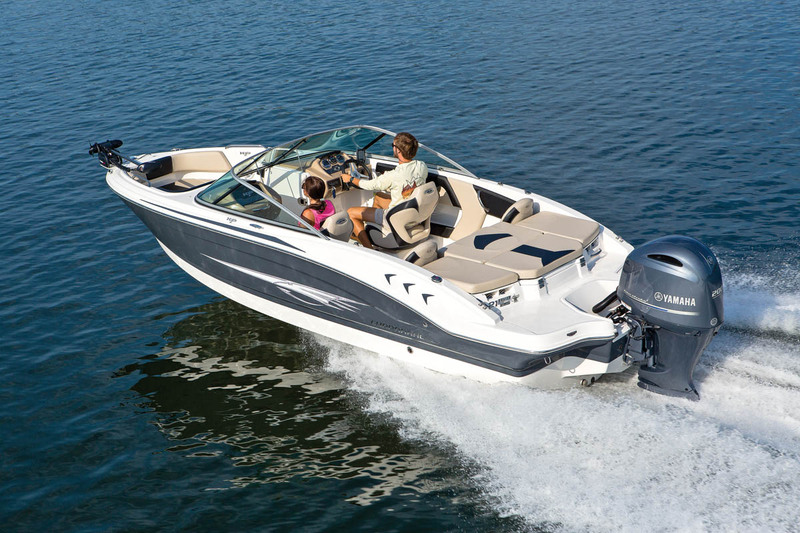 Sometimes manufacturers gouge buyers who upgrade an entry-level boat to higher horsepower, but not here. The bump to an F150 is a reasonable $3,000 and hits our price/performance sweet spot. The upgrade to the F200 from the F150 seems a bit steep at an additional $3,600, considering it’s essentially the same engine with different computer mapping, but doing so could make sense for buyers who are going to carry the max load of 12 people (we’re not sure where they will sit, though). At the high end is the Yamaha F200 with Digital Electronic Control for a package price of $41,495, or the supercharged Mercury Verado 200 with DTS for $41,670. 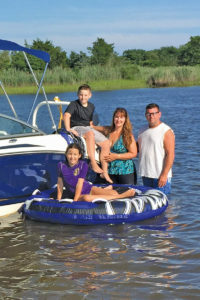 Purchased by Ed and Heather O’Flynn, plus Eddie Jr., 14, and Juliana, 10, Mays Landing, N.J. Purchased at Cecil Marine, Williamstown, N.J. I would love to have a Bimini top that would allow me to enclose the cockpit with isinglass, so we could increase the length of our season. I grew up boating with my dad and got into PWC racing later on. We’ve owned personal watercraft and had a 19-foot bowrider but wanted something that could accommodate more people and be seaworthy enough to take into the Atlantic Ocean when it’s calm. The Chaparral 21 H2O OB is the perfect boat for us. We’ve had as many as seven people on board, and the kids are into tubing and kneeboarding. With the need to store life jackets, filler cushions, tubes and skis, and bring refreshments for all, a regular boat could get pretty cluttered. But because this is a converted sterndrive boat, the gigantic storage compartment can hold everything. We do most of our boating in and around Great Egg Harbor Bay, which is near the Ocean City/Atlantic City area. We bought our PWCs at Cecil Marine, and the service has always been fantastic. It’s a family-owned business that knows how to take care of you before, during and after the sale. LOA: 21 ft., 6 in. Beam: 8 ft., 4 in.